Many thanks to everyone who has viewed and commented on this blog over the years in which it was active. I'd like to think that in some small way it was a corrective to the seemingly endless, romanticised drivel that's often written about 'Historic Exeter'. And, for me personally, it's exorcised much of the great irritation I felt towards what had been my home city for nearly 35 years. Unfortunately there will probably be no further updates. I wish I'd got around to writing about Sidwell Street and Cowick Street, especially, but it seems unlikely now. I no longer live near Exeter and my interest in the city's history has diminished, for better or worse. With best wishes to all visitors, both past and future! 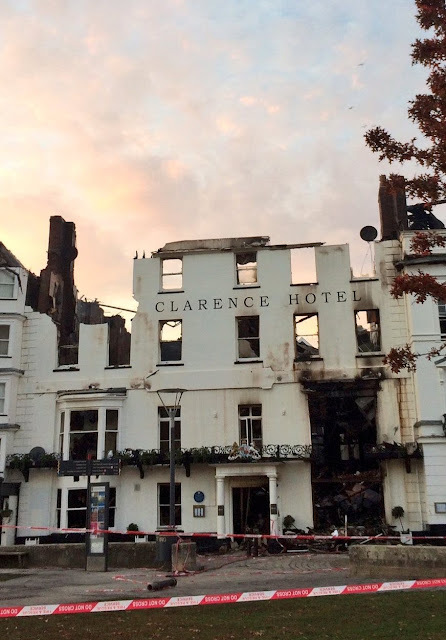 As everyone in Exeter now knows, on 28 October 2016 several buildings in the Cathedral Yard were seriously damaged in a fire, including the Royal Clarence Hotel. Most of the affected structures are historically or architecturally important Grade II listed properties, including the hotel, No. 18 Cathedral Yard below left, the Well House inn at 16 & 17 Cathedral Yard and the former Exeter Bank building on the corner of Cathedral Yard and St Martin's Lane. Unfortunately both the Royal Clarence Hotel and No. 18 Cathedral Yard were almost completely destroyed. It is also a testament to the work of the fire service that the conflagration didn't spread significantly into the small group of 16th buildings that front onto the High Street, although even here there was damage. If the fire had occurred at any other period in time then it's highly likely that these, arguably even more significant buildings, would've been lost too. Cliche it may be, but it could easily have been much worse. And there's obviously also a salutary lesson here in the dangers of having all your historical/architectural eggs in one small basket. Exeter has so few of these 'eggs' that it really can't afford to lose the ones it's got. Another rather unfortunate consequence is that it's led to a resurgence in the usual bleating about the damage caused by the 'Exeter Blitz', and it reminded me again how deeply ingrained this particular myth is in the general Exeter consciousness. Even the bishop was at it, for goodness sake, claiming that the 1942 air-raid destroyed "lots of our medieval buildings in Exeter" as if that event was solely responsible for the destruction of Exeter as a visually historic city. At least Dr Todd Gray, when interviewed by the BBC, mentioned the destructive redevelopments of the 1960s and 1970s while adding that the Blitz only affected 25% of the city [not 75% as many seem to believe]. It seems that the fire started in No. 18 Cathedral Yard. 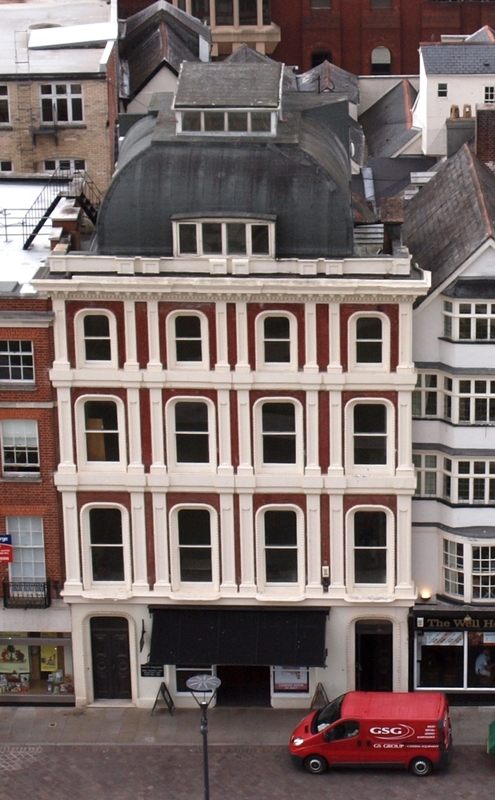 The ground floor was being used as an art gallery and the upper floors were in the process of being converted into luxury apartments. According to media reports, the upper floors had been empty for an incredible ten years as various schemes for their use fell through. Built c.1910, No. 18 was Grade II listed and built of red brick with stucco dressings, pilasters and entablature at each level. It also had a distinctive Mansard roof more typical of France than southwest England. 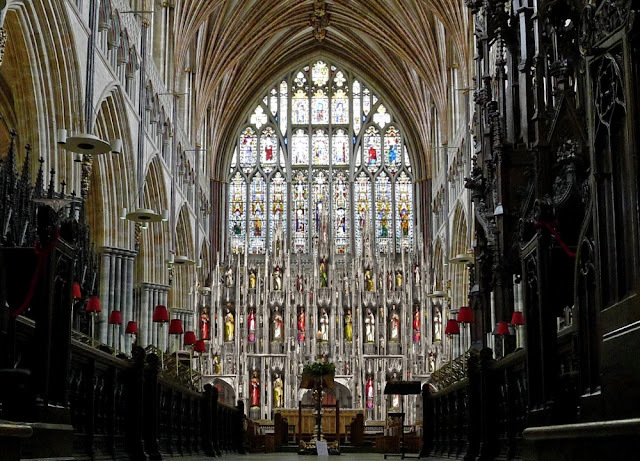 In his book 'Exeter Architecture', Hugh Meller writes that "there is a theory that it was built by a curio collector with a fancy for the French renaissance...it was certainly a curious person who dreamt up the interior" right. Dark mahogany doors with inset mirrored panels and framed by Corinthian pilasters led from room to room, an effect that Meller describes as "weirdly surreal". A staircase, at least part of which was 18th century, ascended through the centre of the building with a galleried landing on the first floor. The most remarkable room however had "gilded wallpaper in the Pompeian style", large mirrors, black fireplaces decorated with stone lions and a very elaborate gilded cornice. Pevsner/Cherry describe this room as "very lavishly decorated in the Louis Quinze style". It's a pity more people couldn't have seen these interiors before they were destroyed at the weekend. No. 18 has been left as a shell although perhaps the exterior at least can be salvaged. Nos. 16 & 17 Cathedral Yard left date from the 1600s, although the facades were refurbished in the 19th century. This makes them some of the oldest surviving timber-framed domestic houses within the city walls. Both stand on very long, narrow tenement plots of a sort once found thoroughout Exeter. The buildings are known to most people today as the site of the Well House inn. The name derives from a well discovered in 1933 of allegedly Roman date which can be seen in the cellars. The cellars also contain a skeleton comprising the bones of two separate individuals. This feeds into the ridiculous story of the bones being the remains of a monk and some woman with whom he was having an illicit affair. Although badly damaged by the fire, especially at the rear, enough appears to survive of both Nos. 16 & 17 to make restoration a real possibility. It's incredible that anything remains of them at all given their wooden construction and the almost total destruction of the buildings on either side. The fire seems to have passed from No. 18 to the Royal Clarence Hotel via the gabled roofs of Nos. 16 & 17 while leaving the fronts and floors relatively intact. Unfortunately the same can't be said of the Royal Clarence Hotel above, built in 1769 by William Mackworth Praed as the city's Assembly Rooms. According to local historian W. G. Hoskins, "this became the first hostelry in England to be called an hotel, the name being first used in an advertisement dated September 7, 1770". The proprietor at the time was the Frenchman, Pierre Berlon. 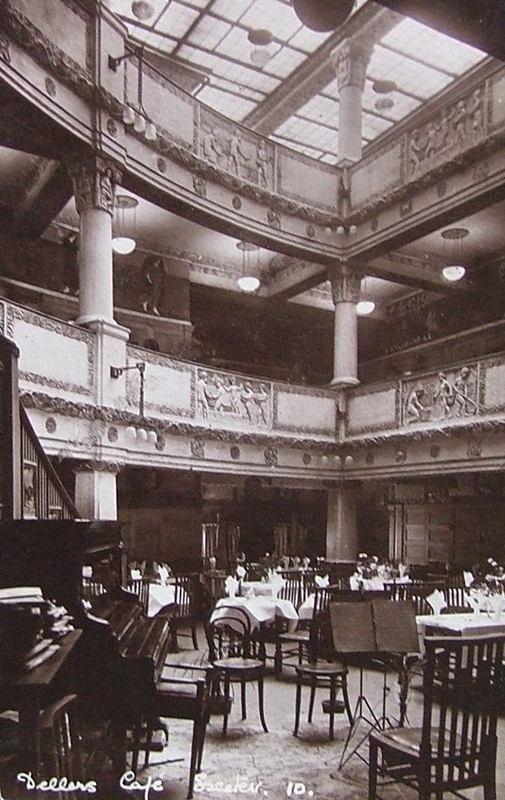 As Hoskins writes, "for a long time his establishment was known simply as The Hotel, even the New London - its great rival - describing itself as an inn". The Hotel was just one of numerous coaching inns and taverns which flourished in the city throughout the 17th and 18th centuries e.g. the Globe, the London, the previously-mentioned New London, the Mermaid, the White Hart, the Valiant Soldier, the Bear on South Street, the Black Lions, the Elephant on North Street, the Half Moon and, oldest of all, the New Inn on the High Street, to name just a few. 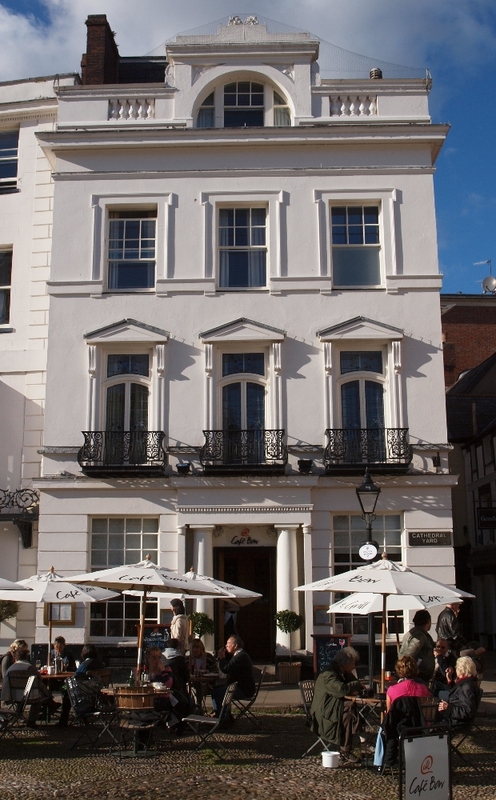 Alexander Jenkins, in his 1806 history of Exeter, claimed that "the Hotel" was "the only House worthy [of] notice" in the whole parish of St Martin's. He described it as "a large and commodious Inn, with elegant apartments and accommodation for people of the first Quality, with a large assembly-room, in which are held the Assize Balls, Concerts and Winter assemblies, of the most distinguished persons of the City and County" [a role that was later to be taken up by the Public Subscription Rooms at the former East Gate]. 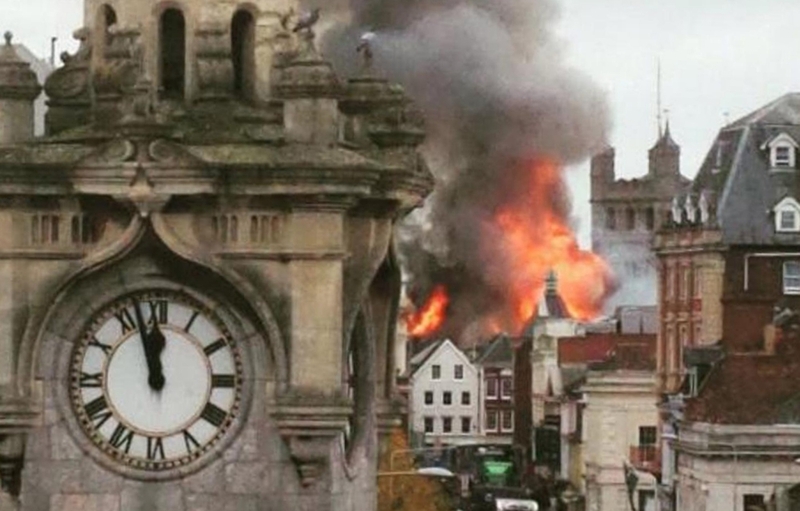 The photo above right shows the Royal Clarence Hotel from the north tower of the Cathedral with associated structures visible behind the facade. Like all the buildings affected by the fire, the Royal Clarence Hotel stood within the footprint of the Roman legionary fort established in the middle of the first century AD by the future emperor of Rome, Vespasian. However, the history of the site really only takes shape during the Middle Ages when, in the 1440s, it was occupied by houses belonging to the canons at the Cathedral, including one William Pencrych. According to Todd Gray, the ground floor and first floor of the Hotel incorporated medieval fabric. In 1732 it was the site of a large house belonging to Nathaniel Matthews and presumably it was this building that was demolished in order to construct what became the Royal Clarence. 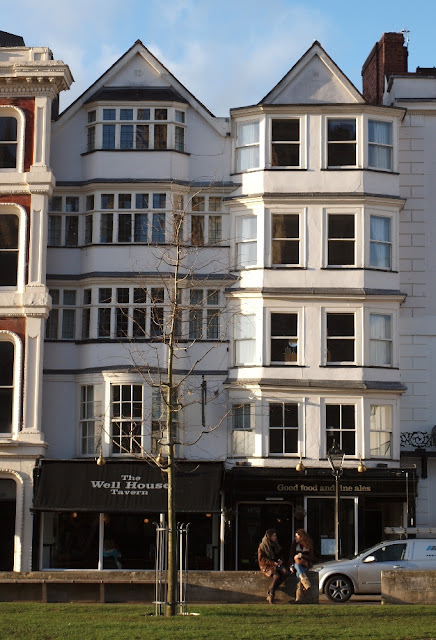 The original 1769 stucco facade was altered during a remodelling in 1827, and it was then that both the bay windows were added and the unfortunate plain sash windows which, compared with the glazing bars of the original, did the facade few favours. 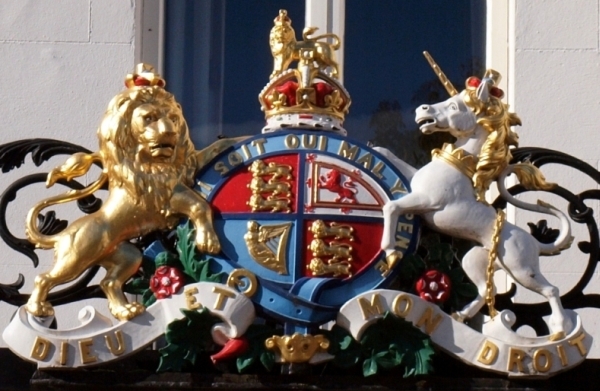 The most attractive details were the two coats of arms with which it was adorned: one on the parapet above, which has unfortunately fallen into the remains of the interior, and another on the Tuscan porch bottom which is one of the finest in the city and which will hopefully be salvaged along with the ornamental ironwork when the ruins are demolished later in the week. As Hugh Meller fairly states, the Hotel was "more significant for its historical connections than for its architecture". It was certainly built too late to feature the elaborate late 17th century plaster ceilings which were such a distinctive feature of several other Exeter's coaching inns [e.g. the New Inn and the Half Moon]. 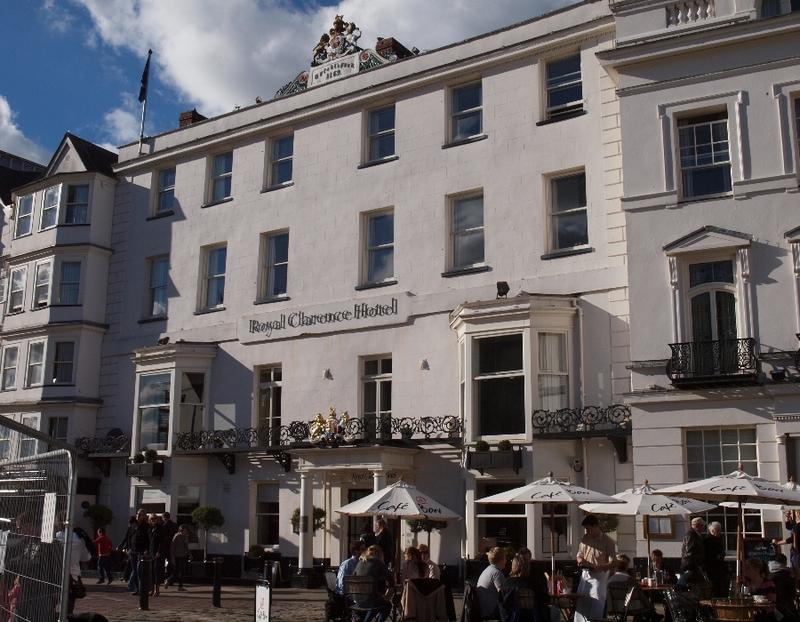 But it had a guest list with which nowhere in Exeter could compare: Lord Nelson, Beatrix Potter, Liszt and Thomas Hardy were just a few of the well-known figures who stayed at the Clarence. The name derived from a visit in 1827 by Adelaide, the Duchess of Clarence, wife of the future William IV. The last property to suffer serious damage was the building on the corner of Cathedral Yard and St Martin's Lane. Now part of the Royal Clarence and Grade II listed, it was constructed in 1769, again by William Praed, as Exeter's first bank right. It opened its doors on 09 July 1769. It was also once the site of Deller's Cafe before that business moved to its extraordinary new premises in Bedford Street in 1916. As a fan of 18th century neoclassical architecture, I think this is one of the most attractive buildings in the city and beautiful in almost every detail. Fortunately the emergency services prevented the fire from engulfing the entire structure. 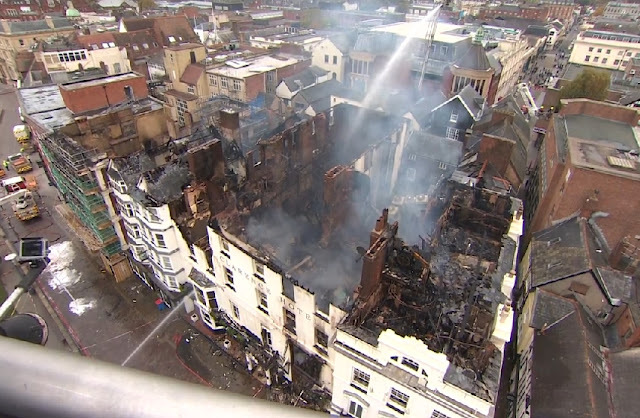 Aerial photographs appear to show the loss of the roof and the attic rooms, and presumably there will be significant water damage, but the bulk of the building appears to have survived intact. There are at least seven other timber-framed structures from the 16th and 17th centuries surrounding those most badly damaged by the fire, sometimes abutting directly onto them: No. 39, No. 40, Nos. 41 & 42 High Street [Laura Ashley], Nos. 43, 44 & 45 and Nos. 46 & 47 High Street [No. 46 is believed to have the oldest surviving carved domestic street frontage in Devon]. Remarkably, none of these have been seriously harmed by the fire. Only the actions of the fire service prevented them being burned to the ground. Talk has already moved onto what will replace the Royal Clarence Hotel even before the ruins have been demolished. 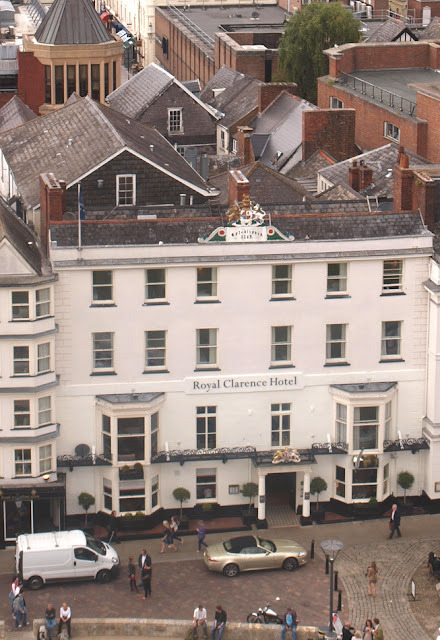 The owners have issued a statement on the subject: "Looking to the future of The Royal Clarence, we have every intention to rebuild the hotel with enormous sympathy to its importance and heritage" [a first for Exeter]. And I've seen several comments from people hoping that the replacement won't be "something modern" [don't tell Exeter City Council]. The bishop has also expressed his opinion: "All the historic stuff inside has gone, you can’t replace it, but at least I hope and pray that they rebuild the frontage as it was because it deserves to be there because that’s what will preserve at least the veneer of the architectural continuity on the Cathedral Green". But since at least 1900, Exeter has always built modern and built new, a doctrine which obviously came to the fore during the post-war reconstruction of the 1950s and the redevelopments in the subsequent decades left. The Royal Clarence is in a far worse condition now than many other significant buildings damaged in 1942, all of which were subsequently demolished and replaced with "something modern". Exeter set its back to the past and turned its face to the future after the Second World War, an ideology which has informed almost every planning decision taken by Exeter City Council between 1945 and the present day. Just think about the post-war reconstruction, or the demolition of medieval houses in the 1970s to build the Guildhall Shopping Centre, or the demolition of Goldsmith Street, or the creation of the inner bypass and redevelopment of Cowick Street, the old Debenhams building, the latest hideous incarnation of Princesshay or the new plans for Sidwell Street, mindless in-fill like Nos. 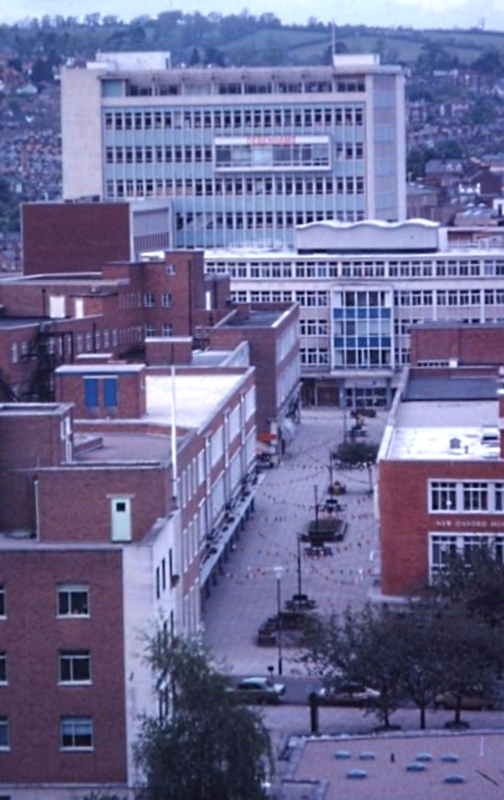 50 - 52 High Street, or the atrocious Marks & Spencer building of 1980. 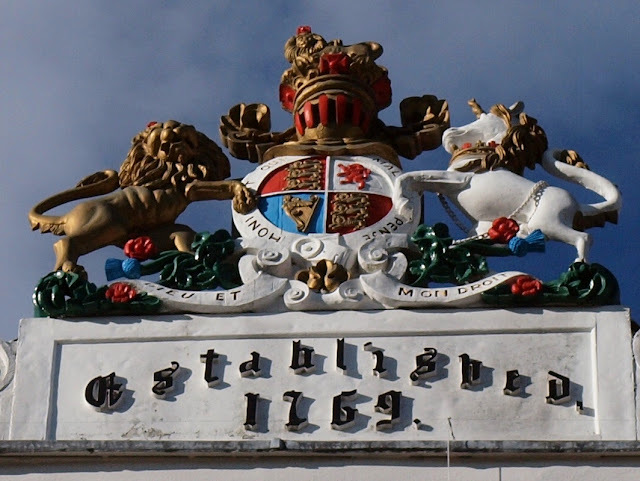 Exeter's integrity as a visually historical city isn't dependent on the construction of a Royal Clarence facsimile facade. That boat sailed a long time ago, so whether a facsimile facade is built or not doesn't actually matter. Theoretically, a modern architect should be commissioned to come up with something grossly inappropriate. 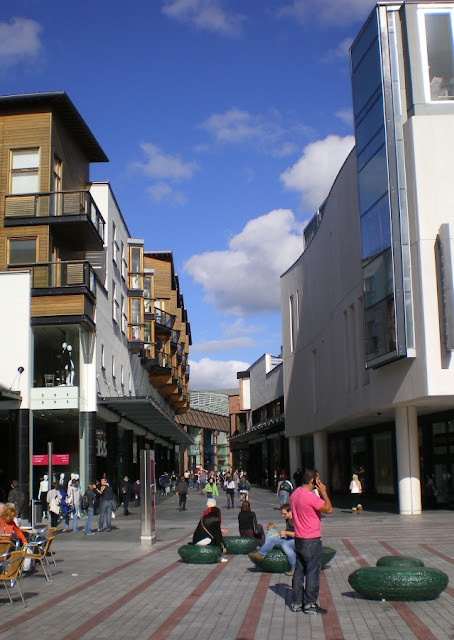 If 'modern' was good enough for the new Princesshay right, to name a recent example, then why not for the Cathedral Green, or is the face of 'modern' Exeter so repugnant that it can't be seen to sully the genteel confines of the ecclesiastical precinct? Surely, if the City Council insisted on a replica facade it would be a huge repudiation of its own philosophy: build new, build modern [although selling Exeter as an attractive historical city would be that little bit harder with a modern carbuncle on the face of one the few remaining historical fragments]. Exeter doesn't 'do' historical reconstructions. Why should it start now? 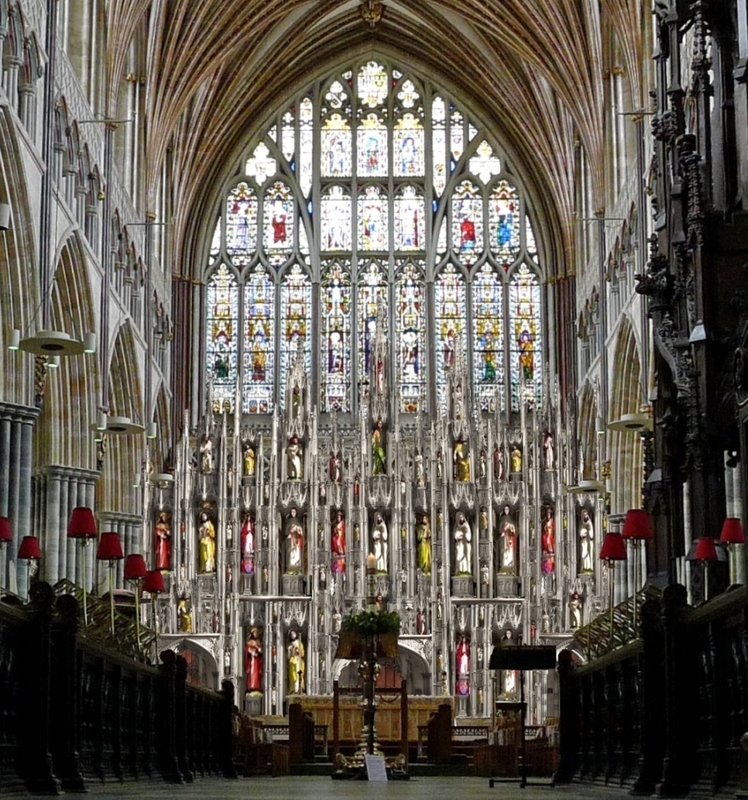 The early 14th century reredos which stood behind the high altar at Exeter Cathedral must be counted as one of greatest lost masterpieces of medieval England. 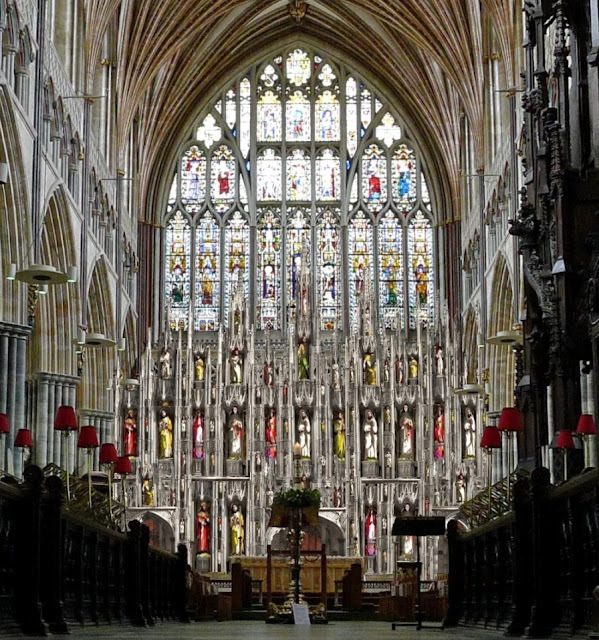 The photo above is a rather feeble attempt by me to reconstruct what it might've looked like c1400, after the Great East Window had been replaced by Robert Lyen and Robert Lesyngham at the end of the 14th century. The photo below right shows the Neville screen at Durham Cathedral which gets mentioned a little further on. We know that the reredos was constructed in the early 1320s, the brainchild of Bishop Walter de Stapledon. 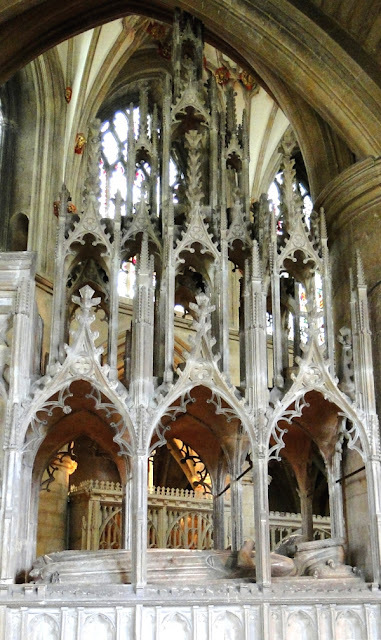 In 1313 Stapledon invited Thomas of Witney to design a canopy for the bishop's throne to install in the cathedral's newly-completed choir. Presumably under Stapledon's direction, the resulting piece of woodwork became what is probably the largest piece of medieval furniture still in existence, towering nearly 60ft (18m) high and covered in intricate detail. 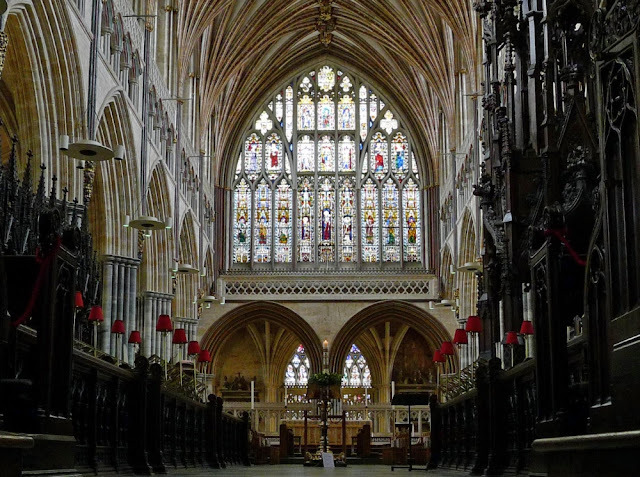 In 1316 Witney arrived from Winchester to take up the post of master mason at Exeter and drew up designs to complete the choir fittings. This included the creation of the sedilia (a stone structure with three seats near the high altar), the pulpitum (a massive stone screen between the choir and the nave) and the reredos behind the high altar. The throne canopy, sedilia and pulpitum still survive and according to Pevsner & Cherry "cannot be parallelled in any other English cathedral". There is no reason to doubt that the reredos was any less spectacular than the other fittings designed by Thomas of Witney for Bishop Stapledon. The photo below left shows part of the tomb of Hugh Despenser at Tewkesbury which might've drawn inspiration from the Exeter reredos. Work started c.1316 and the reredos was largely complete by 1325. Such was its scale that it even had its own set of accounts which, when combined with the archaeological evidence, at least give some idea of what the reredos might've looked like. The reredos consisted of a large stone screen which stood directly behind the high altar. It extended across the full width of the choir. The sedilia and the tomb of Bishop Stapledon stood at the ends of the reredos and the sedilia at least was probably conceived as part of the overall composition. The reredos was at least as high as the sill of the east window and the tops of the pinnacles probably went up even further. The bottom of the screen was made of solid stone inset into which were three doors. These doors were lockable and led into a vestry immediately behind the altar. The upper parts of the screen were almost certainly open and contained canopied niches for statues. According to Jon Cannon, the reredos "originally contained up to forty-eight separate statues arranged between three delicate tabernacles [i.e. 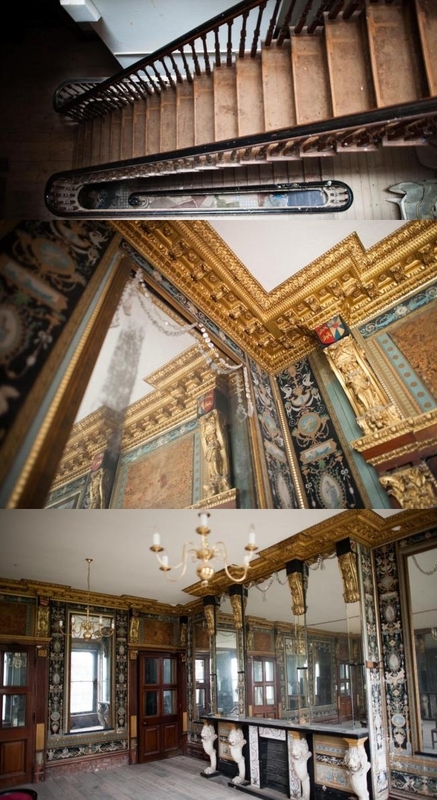 decorated niches], and 12,800 sheets of gold foil were used in its decoration". The niches would've contained miniature stone vaults. There was certainly a statue of the Virgin Mary and Child, St. Peter and St. Paul as well as a lily of metal foil. The statues probably represented apostles, prophets and angels all of would've been painted in bright colours. Veronica Sekules has stated that: "At this date, between 1316 and 1325, such a grand structure, free-standing behind the altar and closing it off completely from the area behind, is exceptional and possibly unique. Very few comparable English 14th-century examples are known". 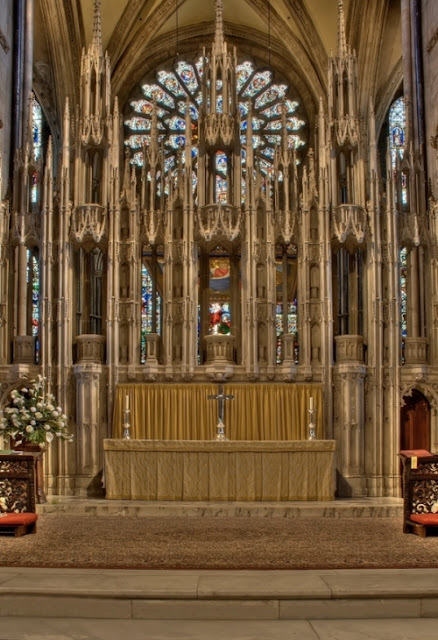 One of these examples is the Neville screen which stands behind the high altar at Durham Cathedral, described by Henry and Hulbert as "the nearest comparable screen" to the reredos at Exeter and upon which I based the reconstruction. 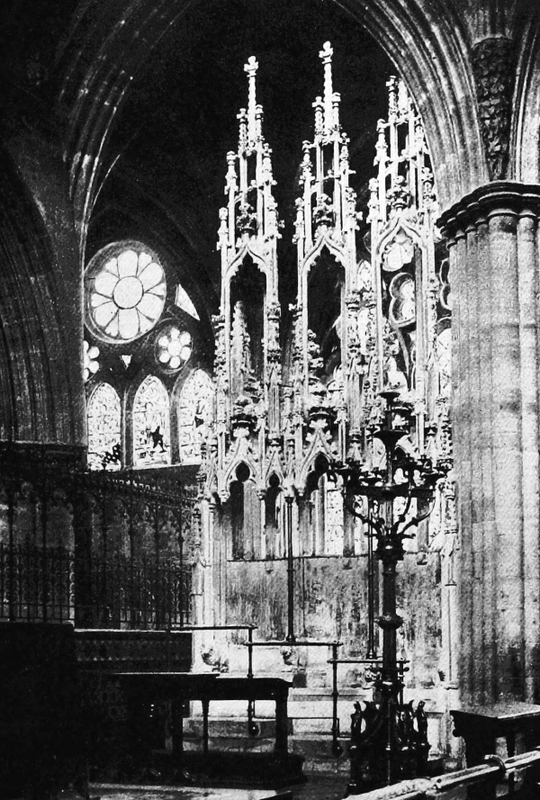 The Neville screen was built c.1380 and so is around fifty years later than the Exeter reredos. 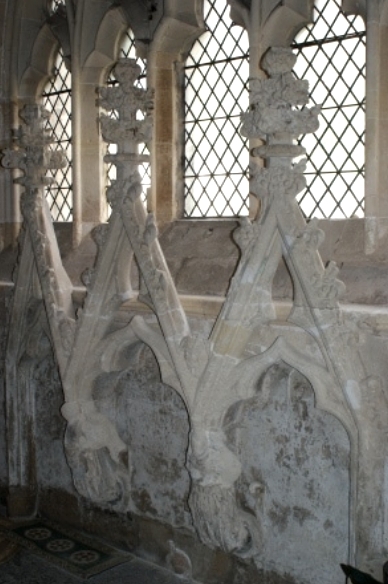 Given the differences in the date it's possible that the reredos not only influenced the open work pinnacle design of the Neville screen but was also the inspiration for other 14th century structures, such as the tomb of Edward II at Gloucester and the tomb of Hugh Despenser at Tewkesbury. 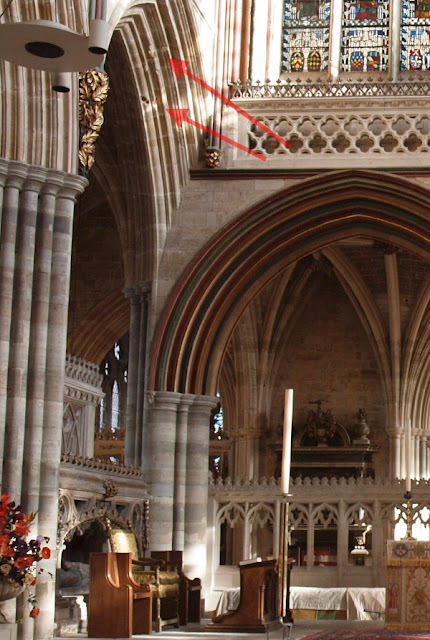 Apart from the canopy over the bishop's throne, the other structure which might give some insight into the appearance of the reredos is the sedilia at Exeter left, designed by Thomas of Witney at the same time as the reredos. "It is very likely that from the design of the sedilia we can to some extent extrapolate the design of the reredos" (Veronica Sekules). The sedilia ranks as one of the finest examples of its kind in the country. The photo above right shows the rear of the sidilia as seen from the south choir aisle (it's difficult to get a good photo from the front as it's set back in one of the arcade arches and the area in front of the high altar is roped off). It is a structure of breathtaking beauty. 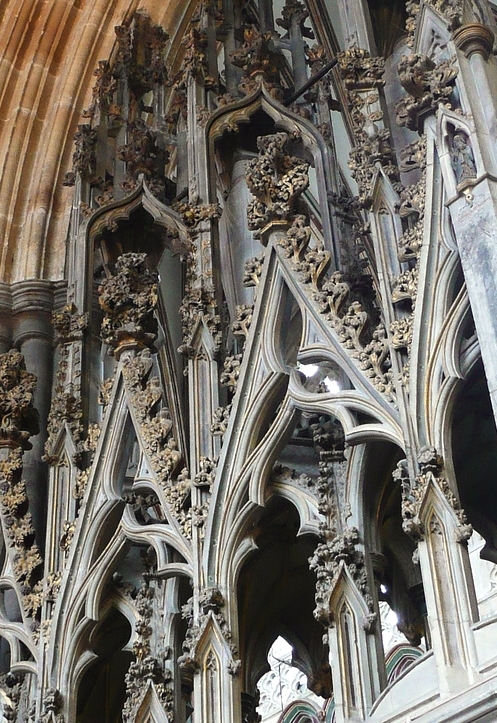 The quality of the carving is superb and the forms achieved within the triangular arches alone are works of art in their own right. It is possibly a finer, more subtle, more delicate and inventive achievement even than Witney's slightly earlier throne canopy. Stapledon must've been delighted with it. If the vastly larger reredos was remotely similar, which is in all probability it was, it indicates the huge magnitude of the loss. And that was just the stone framework which was in turn adorned with nearly forty-eight carved and painted statues. The sedilia has been much restored, particularly by George Gilbert Scott in the 1870s when he inserted around 1400 pieces of stone, and after some war damage in 1942. But its medieval form has survived largely intact and it is stunning, each seat crowned with a star-vaulted, seven-sided canopy on top of which is a three-sided ogee-arched canopy crowned with crocketed pinnacles. Stapledon's largesse didn't end with just providing significant funds for the reredos. He also funded a silver altar table which was in place in front of the reredos by 1327. 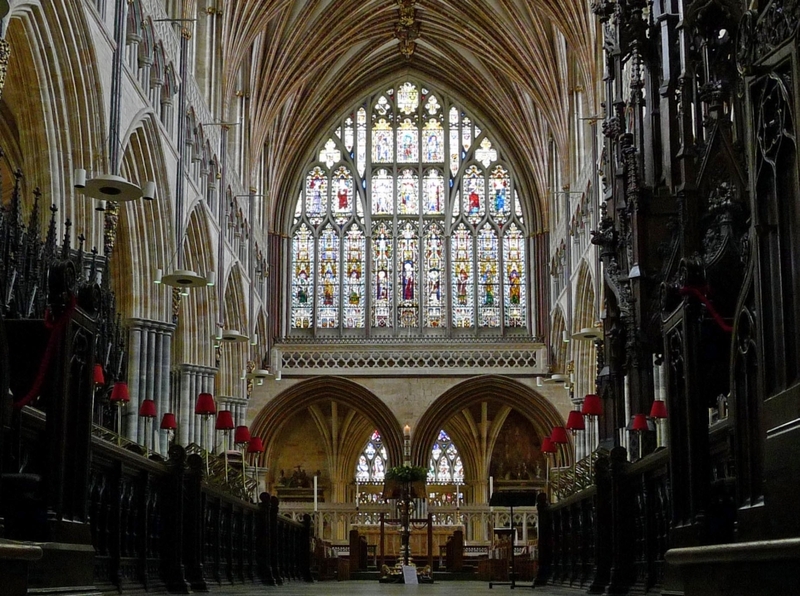 When John Leland visited Exeter in the late 1530s he reported that "Bishop Stapledon made also the riche fronte of stonework at the high altar in the Cathedral church of Exeter and also made the riche silver table in the middle of it". During the Reformation this retable was allegedly hidden within the walls of the Chancellor's House in the Cathedral Close. True or not, the retable doesn't exist today and presumably ended its days melted down and in the coffers of the Tudor court. The Reformation also saw the reredos stripped of all its idolatrous images. Only one small fragment of the statues might still survive, a figure of a king which was perhaps relocated inside the tomb of Bishop Stapledon. Stapledon was beheaded by a mob close to St. Paul's in London in 1326, his body was later returned to Exeter by Isabella of France. A second fragment above right could've been relocated to the north wall of St Andrew's Chapel. The masonry consists of three gable arches with ogee arches underneath. The design is very similar to the arches at the back of the sedilia. It's possible that these are just a few of the niche canopies from Stapledon's reredos but the fragment could equally have come from the reredos in the Lady Chapel or elsewhere in the cathedral. Otherwise the great reredos is only present by its absence. The photo left shows one of the arches in the north arcade of the choir, or presbytery. 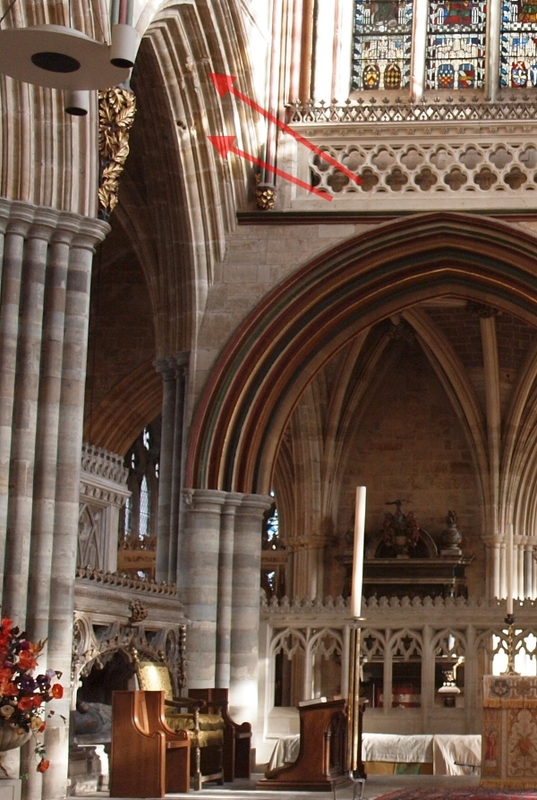 High up on the arch are some scars in the masonry which remain to indicate the minimum height of Stapledon's reredos. Comparison with the chairs on the floor illustrate just how enormous it was. The back of the stone framework appears to have survived the Reformation up to the height of the east window. It was plastered over in 1638 and painted with a trompe l'oiel perspective. In 1818 the painting and remains of the reredos were demolished. A report in the 'Exeter Flying Post' of that year announced that "on Monday the Cathedral was shut up for the commencing of the new works, of taking down the altar screen, supposed to have been erected in the early part of the seventeenth century, on the scite of the more antient altar of the age of Bishop Stapledon. The screen, now to be removed, is a plain surface, painted in a style of mixed Gothic and Grecian". The report clearly believed that the Stapledon reredos couldn't have been as high as the remaining masonry suggested but hindsight has shown otherwise. The painting and the remaining part of the screen was demolished and that was the end of Bishop Stapledon's reredos. The reconstruction of the reredos above is highly conjectural and is probably wrong on pretty much everything! I only managed to fit on about half the total complement of statues. It's really just designed to try and convey something of the screen's former magnificence and show how it must've dominated the choir. If anything it was even larger than depicted in the reconstruction. The only thing that is perhaps fairly accurately demonstrated is how the reredos worked in conjunction with the east window to create a vast expanse of iconography at the eastern end of the cathedral. When the reredos was completed the entire east wall would've been filled with colour images, whether in stone or glass. The same view below shows what a devastating impact the Reformation had on English medieval art.